This chart is from the Goldman Fristoe Test of Articulation (GFTA)- 2nd Edition. It seems to be the most accurate from my experience. However, there are several varying norms for articulation out there. This chart, nonetheless, should give parents a general idea of what to expect from their 2-7 year olds! Initial, medial and final refers to the placement of that sound in a word. For example, a word that has “b” medial would be “trouble”. Here is a chart that I found from Mommyspeechtherapy.com. 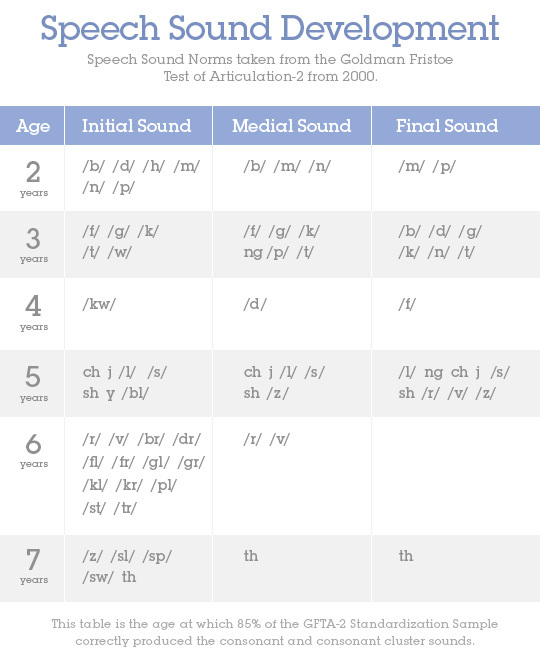 This is a great chart that breaks down the phonological processes that should be eliminated and by which age! Phonological processes are patterns of articulation errors. These errors are usually more significant and frequently occurring in children’s speech, making it more unintelligible. Examples of each “process” is listed, as well!